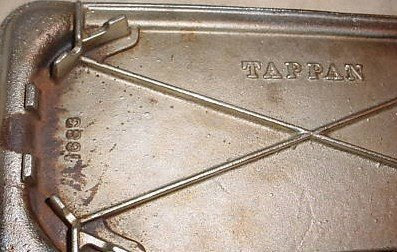 In a stroke of luck, I ran across a vintage stove top Tappan griddle to buy. 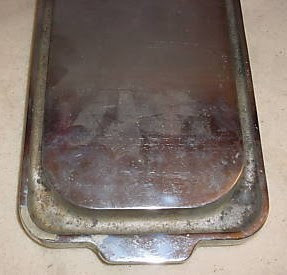 This griddle will sit on one front & one back burner on my Tappan Deluxe. The photos show a lot of smudges in the griddle. but those cleaned up really well. It's in very good condition. I have no idea if this was the version sold with my stove, but it will work. 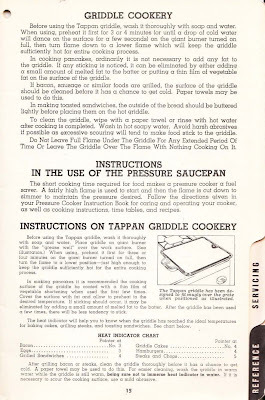 The Tappan Deluxe Owners Manual I have shows a griddle that sits only on the front burner. I took a little time off this afternoon to drive over to the Longfellow Community Council offices in SE Minneapolis. They have a new book "A Look Back at Life in Longfellow - The Neighborhood by the Falls" by Eric Hart & The Longfellow History Project that I wanted to buy. The book has 7 chapters: Mighty Mississippi, Early Settlement, Longfellow in 1900, Social Life, Entertainment, Building Longfellow and 21st Century. All that and a ton of photos. Everything a Minneapolis history buff like me could want :-) Can't wait to sit down and read it. The "tin-type" tile that will be going up in my kitchen. I'm pretty much of an old house purist. Obvioulsy I'd prefer plaster, but that's not gonna happen. The alternatives I considered were drywall, tin, tiles. I'm just not a drywall person. Tin, while very pretty, is a little overpowering for a small working class bungalow kitchen. Acoustic tiles are so, so ugly. But, this little decorative tile grew on me. Surprisingly. I have "sat with" the idea for a few months now, and I think the subtle design will work fine. If the next owner hates it, they will be able to take it down easily. I have a few tricks up my sleeve for the install (more on this later). It will be painted a very light vintage green. Here's another thing I uncovered this past weekend. Back in 1924 when this house was built, the kitchen stove was vented by a pipe out through the chimney. The chimney runs up behind one of the plaster walls. 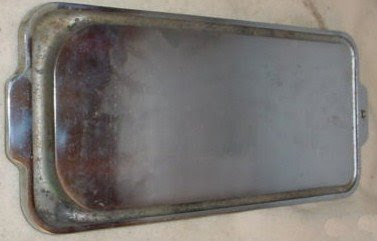 When the old stove was removed, one of the POs took some window screen & joint compound and covered the hole. The patch was then covered by some big box cabinets. I took the cabinets down a long time ago and the patch was pretty ugly. There also was a 99% chance that the actual hole in the chimney had not bee repaired behind the patch. My new cabinet will be going in that corner, so now was the time to find out exactly what was behind the patch and repair it. I've received advice from some old house folks that have gone through this same process. Consensus is that the chimney brick should be filled in & then the wall repaired. Cute little copper flue plate, no? You know that will be saved and used in the future. I pulled down the rest of the old acoustic tiles from the ceiling in my kitchen. What you see under there are little stick-on tiles underneath the furring strips. They are staying up. Let's have a moment of silence for the ruined plaster beneath it and try not to be bitter. I'm pondering if I should fix the big, lath-baring hole in the plaster before I put up the new ceiling. I probably will, or it will bug me knowing it's there. Oh, and fear not. The white bulb lights' days are numbered. 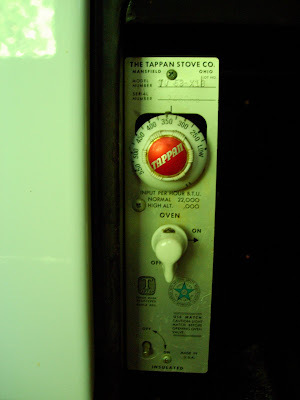 Just a very quick little post with a quick tip for other folks working on a Tappan Deluxe. The thermostat knob slides off very easily and cleans up nicely with an old toothbrush and some warm soapy water. Here's my before & after. If you had a vintage bathroom and the tub spigot was chrome and had a little hex design that mirrored the hex tiles on the floor.....why would you remove it (gouging the chrome in the process), hide it in the basement and replace it with a plastic fake metal one? Now if I could find some cool hot & cold faucet handles, we'd be back in business. I need to order insulation, light socket & one handle. Then I need to call the stove repair names I have to see if they can rewire & recalibrate. The end is actually in sight.